- Redesigned security certificate management page. - Accessibility updates for database resource icons and search results facets. Note About Site Cleanup: If you've switched to a custom domain or have otherwise had a domain change, including moving from a beta site to your live site, you should update any redirects and links that point to the old site url. - Receive Images on Social: If patrons post images on your Facebook page or in their Tweets, you'll be able to see them in your LibAnswers social feed. - Post Images on Social: Easily upload images to your Facebook/Twitter posts right from the Social Tab. Mini release focused on maintenance and performance tweaks. 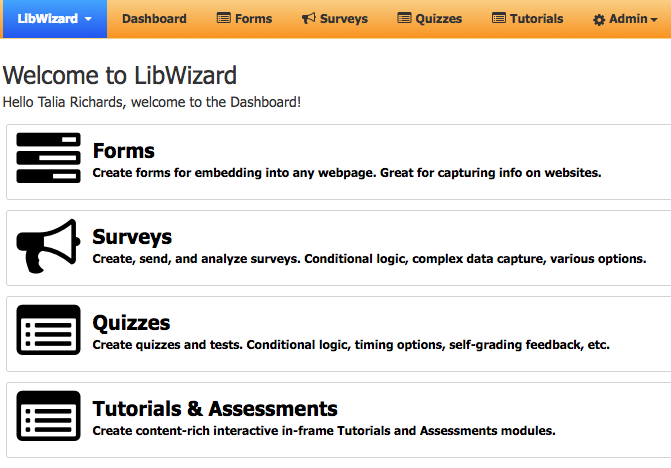 You'll notice a faster, smoother, LibWizard experience! - HTTPS Note: If you're not using LibWizard with HTTPS, please test and ensure that HTTPS works fine for you because otherwise, when browsers start to force HTTPS, your forms may break if you’re not prepared. 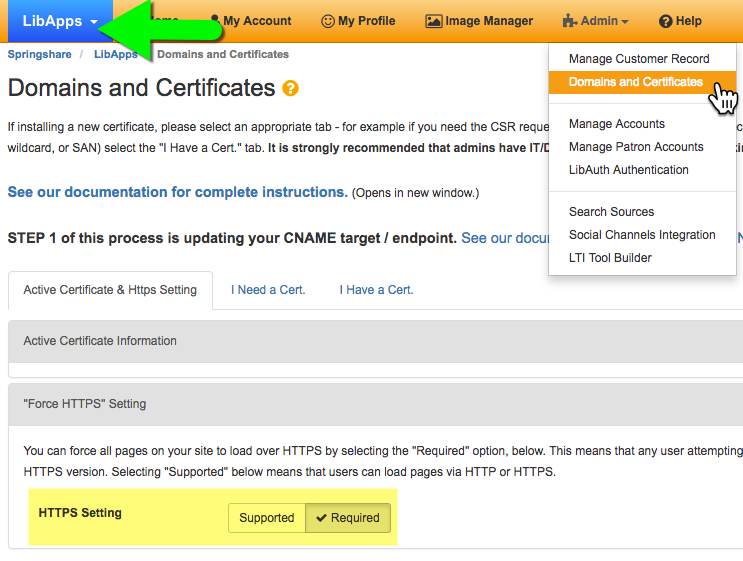 We’ve written more about HTTPS, so be sure to check that out! 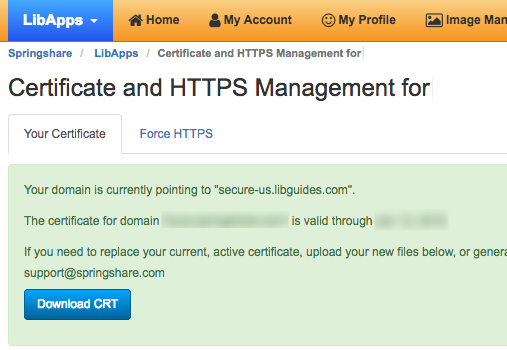 LibApps Admins can now upload security certificates for LibGuides, LibAnswers, and LibCal custom domains! All products that support custom domains now also support security certificates for those domains. Why Are We Doing This...And Why Now? What's a Security Certificate and Why Do I Need One? Change your LibGuides, LibAnswers, or LibCal custom domain using our self-service tool! How Do I Change It? Where Do I Go? What Do I Do? Can I Change My Domain if it Ends with a .libguides.com, .libanswers.com, .libcal.com? LibInsight, LibStaffer, and LibWizard do not support custom domain names. They can only end in .libinsight, .libstaffer, and .libwizard, respectively. More Exciting Features Coming Down The Pike! If students can't remember their course name, number, or their professor, they can still find their E-Reserve items by searching for the title from the EReserves landing page. Ability to custom ordering of Database Best Bets. Ability to create custom fields (Coverage Dates, Max Concurrent Users, License Type) and activate them as needed. A-Z Database widget will act just like the Database search box on the main A-Z landing page. Alt Text for Book Covers - Write your own custom alt descriptions. Amazon Books Covers HTTPS - Book covers loaded via Amazon will include HTTPS support. Bowker Enhanced Content Fix - We'll be fixing the existing bug dealing with Bowker enhanced content. If you have LibAuth connected to your local authentication layer (SAML, Shibboleth, CAS, SIP2, Active Directory, LDAP, etc. ), when a patron signs into your LibGuides, it will auto-create a patron-level account for them. This means, they'll be able to quickly and easily comment on your blog posts, discussion boards, etc. without you having to make a patron-level account one-by-one. Easily upload and send images with your Twitter and Facebook posts and receive images on incoming posts as well. A complete redesign of the LibChat operator screen that will enable you to juggle multiple chats at once and include stronger operator-to-operator features for more internal use. Billing: Set and assess charges for space & equipment usage and calendar event attendance. Event Templates: Creating similar events over and over again and want to streamline the process? Create event templates and then apply that template when creating a new event. Shift Templates: Create a week's worth of shifts at a time and reuse them, including assigned staffers. Reuse Shifts Across Schedules: Quickly copy shift times and details into a new schedule. LibGuides CMS users will be able to make use of the file upload asset type in LibWizard Lite's Survey & Form Builder. Patrons can upload files directly to their form/survey submissions - great for gathering screenshots, assignments, etc.